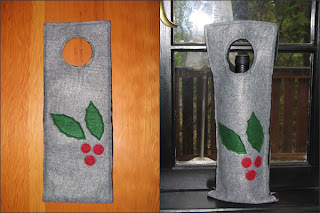 I now have 3 more wine bags in progress... I created one with an upside down candy cane on it (oops!) so needed to rework it. 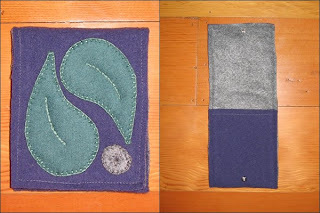 I cut the felt in half then created a bottom for the bag by overlapping the pieces and added some handles. It's not too shabby considering I had to rethink the design. I'll probably finish these bags up then work on my goody bags... All is time permitting at this point since I'm all of a sudden getting tons of work. At least these contracts will pay for more supplies! 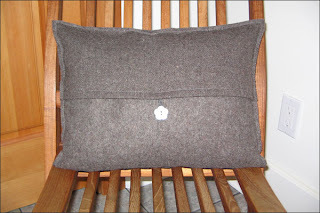 I made a quick pillow cover out of some brown wool I had this weekend. 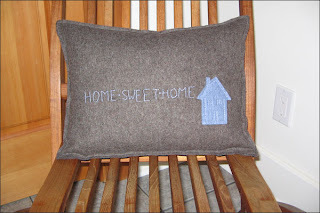 I added a baby blue house then sewed in "Home Sweet Home". On the back I've added a pretty blue button I bought at Walmart. The cover is not perfect... I made a minor mistake. Hopefully no one can tell what it is! After a bit of a break I've booked today for sewing. 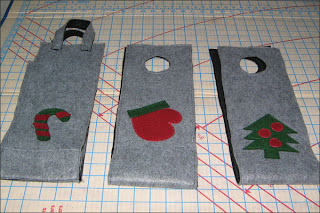 I'm starting on my Xmas gifties - today I'm making felt wine bags after seeing one at a local craft sale. I found something similar on Eco-Handbags.ca that I modified. I'll make a couple today then change the dimensions to make goodie bags. My Mom and I usually make goodies for gifts - shortbread, truffles, etc. 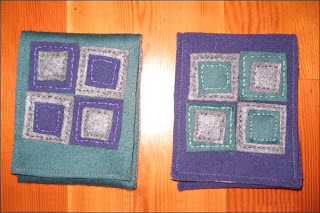 This way I can make re-usable bags that are somewhat funky... And just as cheap as a store-bought bag. 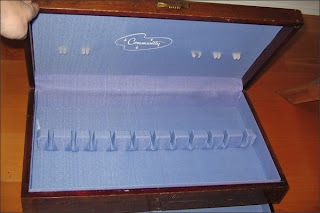 I picked this silverware box up yesterday at the Salvation Army for $12. 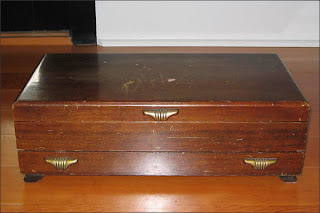 It's quite the find with the Art Deco handles. Paul and I can hopefully refinish it soon. I'm not sure what we'll use it for but it'll be quite the swanky box once it's been redone. Exciting! 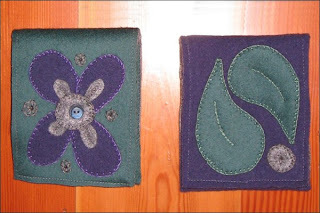 Next I'm going to make felt applique book covers for some sketchbooks I bought. One for me then I'm making a couple for Xmas gifties. The sketchbooks are a great size for putting in your purse and taking them around with you... And they were 50% off at Opus Framing and Art Supplies in North Vancouver. Each will cost under $10 for all of the supplies. Next I'll sew my other Blackberry cover and maybe whip up some mini purses. 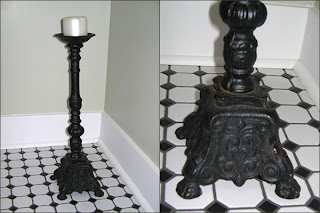 I bought this cast iron candle stand at the Salvation Army in North Vancouver this week for $6. I love it! I carried it in my backpack from North Vancouver to Gibsons on the bus then onto the ferry - it was a little awkward but worth it!